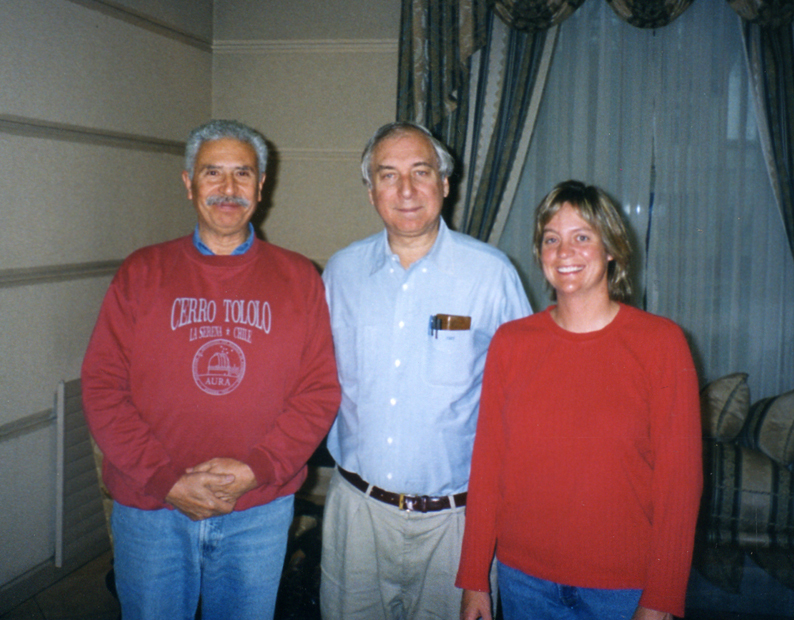 In La Serena, the group met on arrival at the airport the weekend before the Friday event. 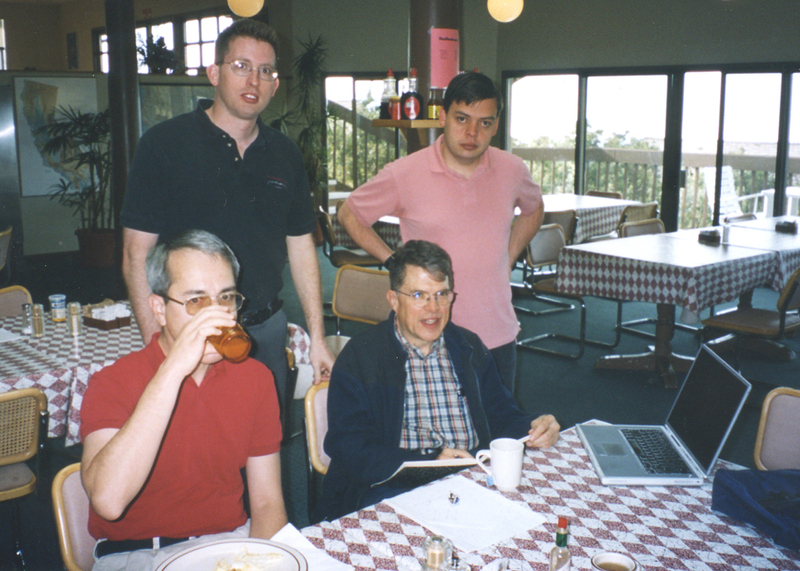 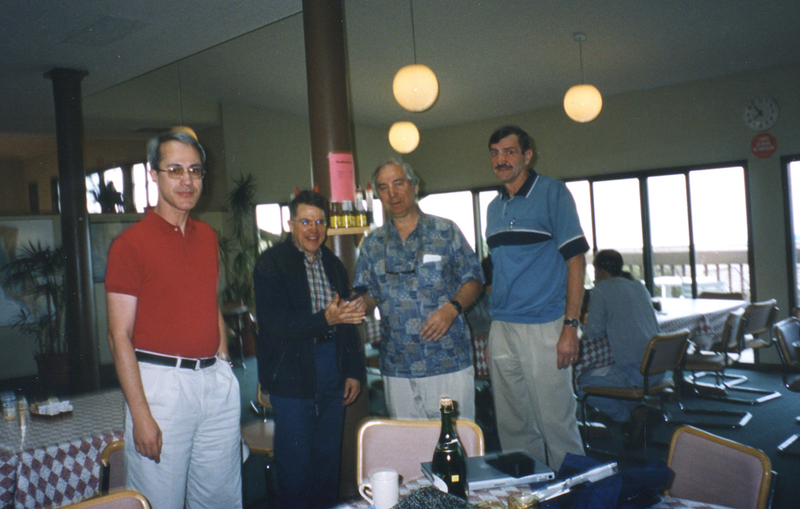 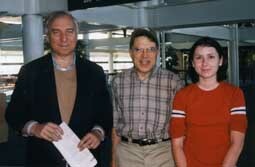 Here we see Brian Taylor (Lowell), Jim Elliot (MIT), Ted Dunham (Lowell), and Jay Pasachoff (Williams College). 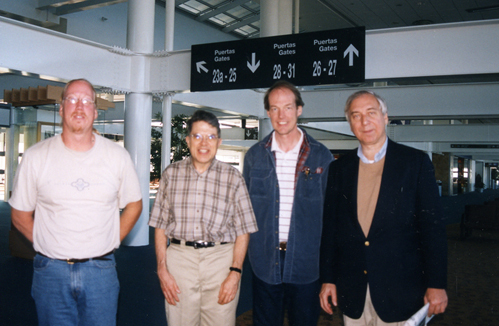 We had a planning session over lunch at the airport. 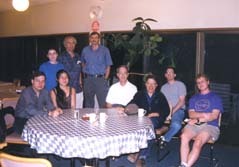 Left to right: Ted Dunham, the waitress, Steve Souza, Jay Pasachoff, Jim Elliot, Kelly Clancy, and Brian Taylor. Jay Pasachoff and Jim Elliot. 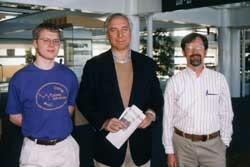 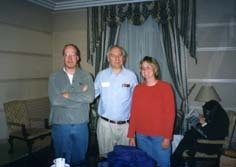 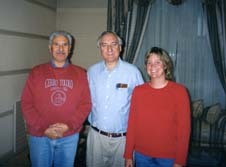 The Williams team: David Ticehurst (Williams '03), Jay Pasachoff, and Steve Souza. 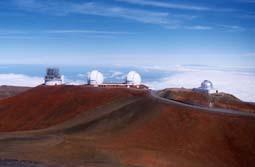 For the August 20 event, a different team gathered at Hale Pohaku, the mid-level facility for the Mauna Kea Observatory. 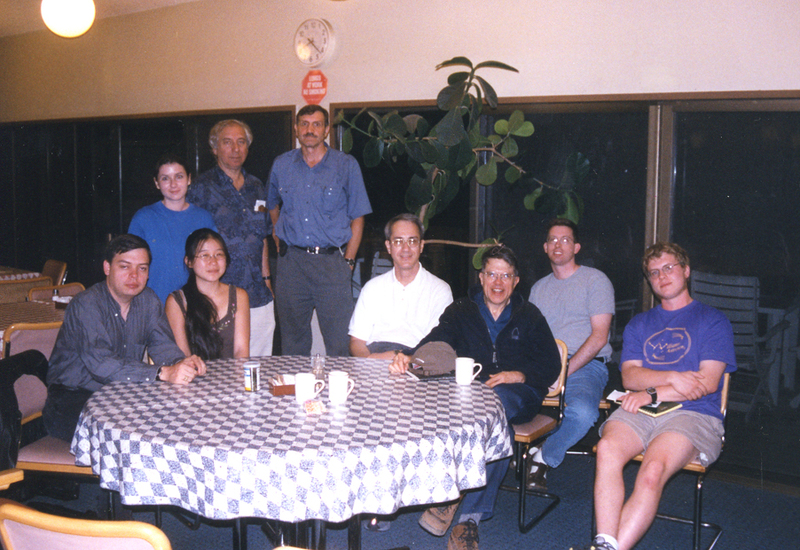 We see Mike Person (MIT), Kelly Clancy (standing), Jing Jing Qu, Jay Pasachoff (standing), Bryce Babcock (standing), David Tholen (University of Hawaii), Jim Elliot, David Osip (MIT), and David Ticehurst. 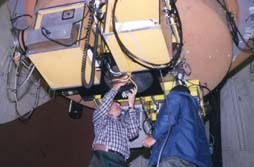 Bryce Babcock and a technician installing the Williams College CCD. Part of the view from the 88" telescope: Gemini North (foreground) and the Canada-France-Hawaii Telescope. 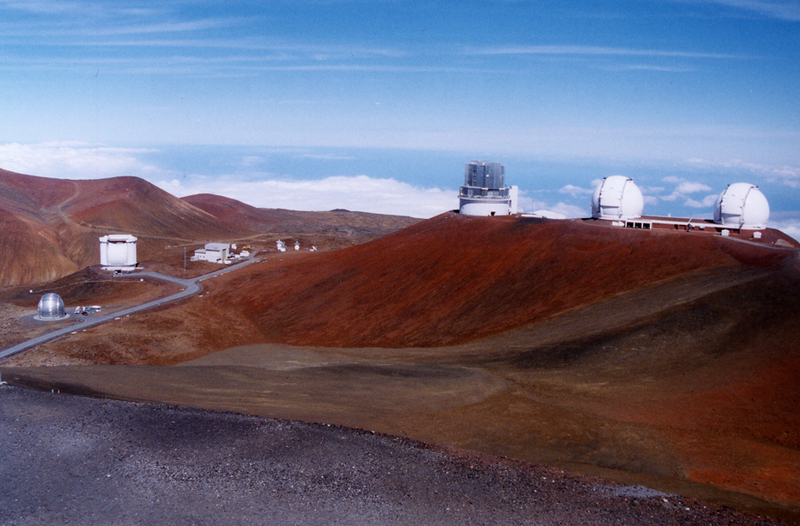 Part of the view from the 88" telescope: At left we see the "Millimeter Valley," with the Caltech Submillimeter Observatory (CSO), the James Clerk Maxwell Telescope (JCMT), and several antennas and a main building for the Smithsonian Submillimeter Array (SMA). 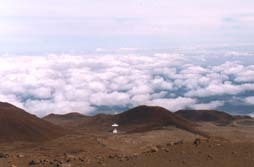 On the ridge at left, we see the Subaru Telescope and the twin domes of the Keck Telescopes. 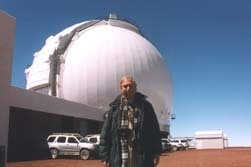 Subaru, twin Kecks, and the NASA Infrared Telescope Facility, which was used by Jim Elliot and Kelly Clancy during the occultation. 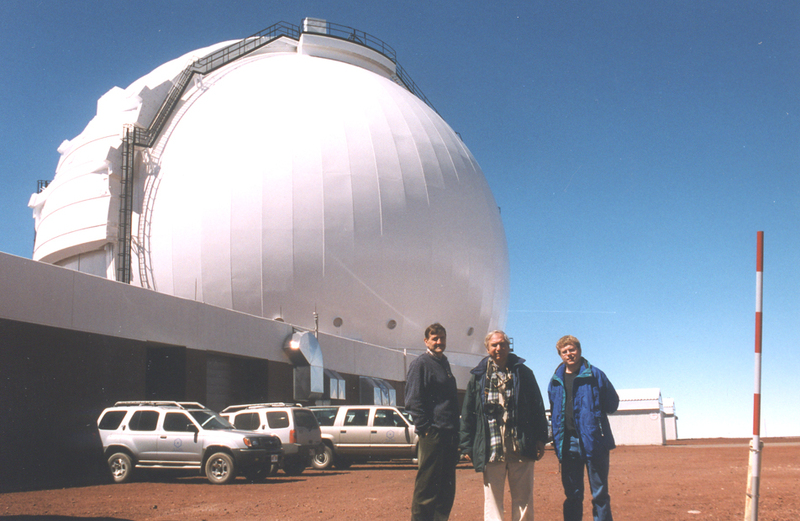 The Williams team (Bryce Babcock, Jay Pasachoff, David Ticehurst) in front of one of the Keck domes. 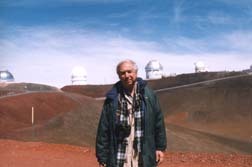 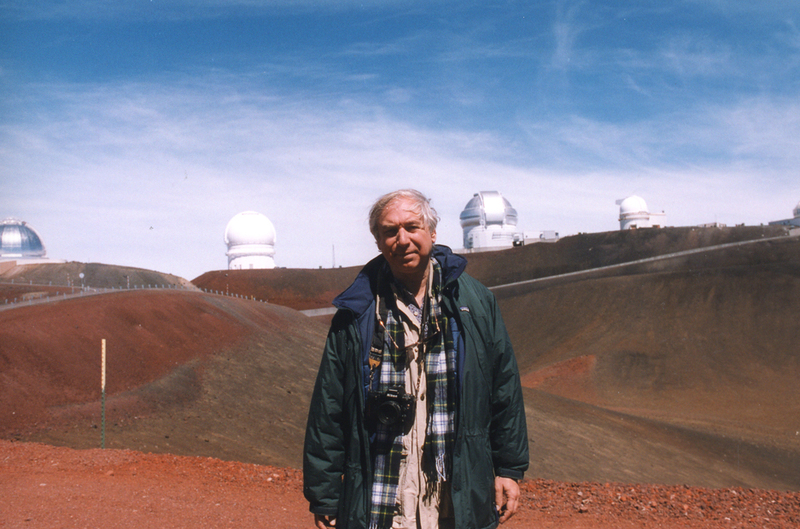 Jay Pasachoff in front of a Keck dome. 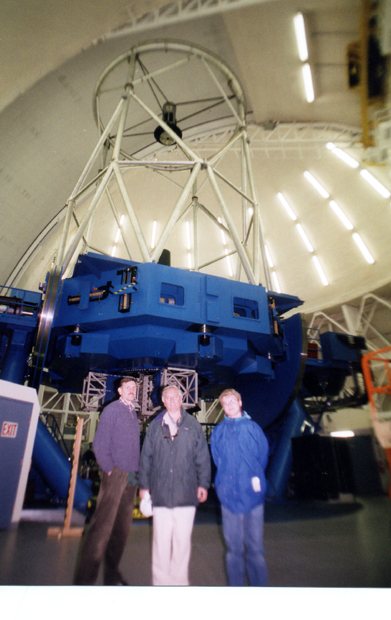 Jay Pasachoff in front of, left to right, the IRTF, the CFHT, Gemini North, the 2.2-m, and the UKIRT, also in use for our group in the Pluto occultation, with David Tholen and David Osip. 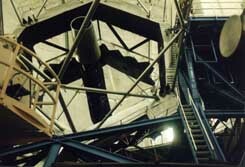 The 10-m mirror of Keck 2. The mirror reflects a framework of struts; more faintly, one can see the hexagonal individual mirrors that go into making the overall Keck mirror. 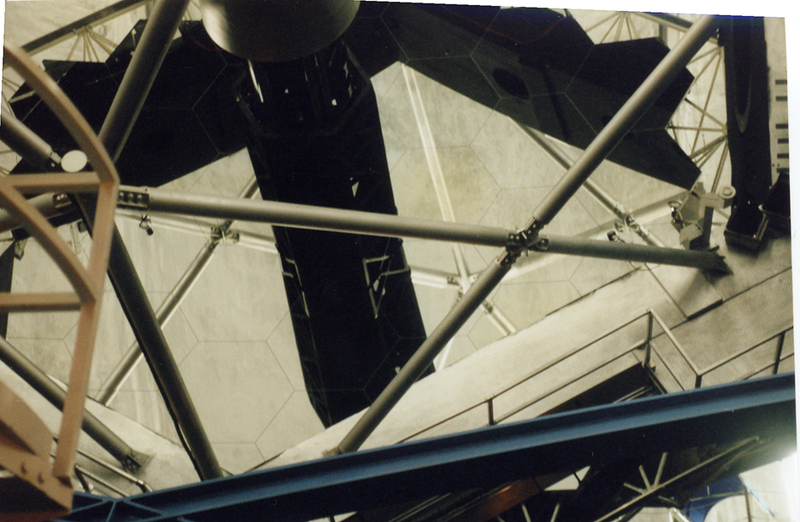 Part of Keck 2's 10-m mirror, showing the framework of struts and the individual hexagonal tiles (each 1.8-m across) of the Keck mirror. 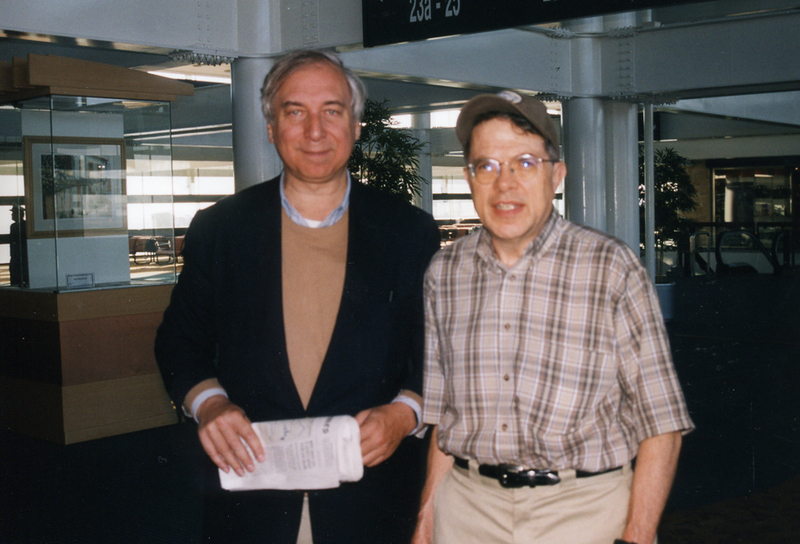 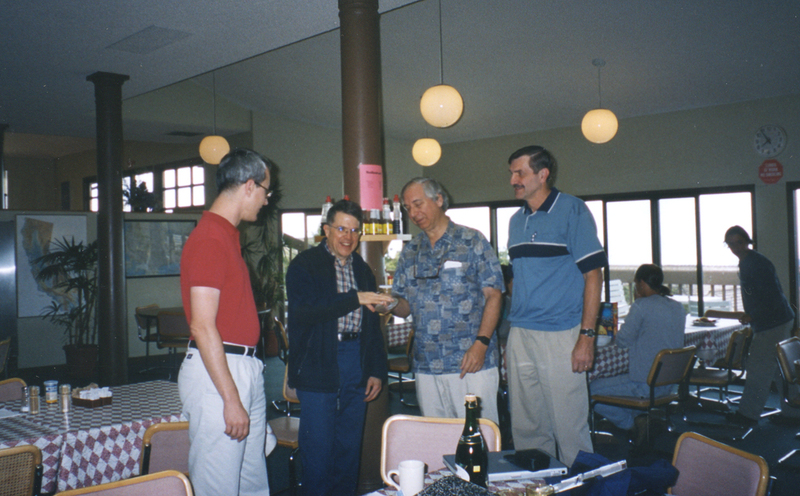 The morning after: The ceremonial handing over of the Williams College Pluto occultation data on a CD-ROM from Jay Pasachoff to Jim Elliot. 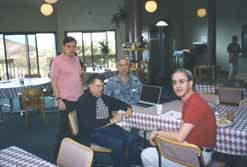 David Tholen is at left and Bryce Babcock is at right. They are in the dining room of Hale Pohaku. 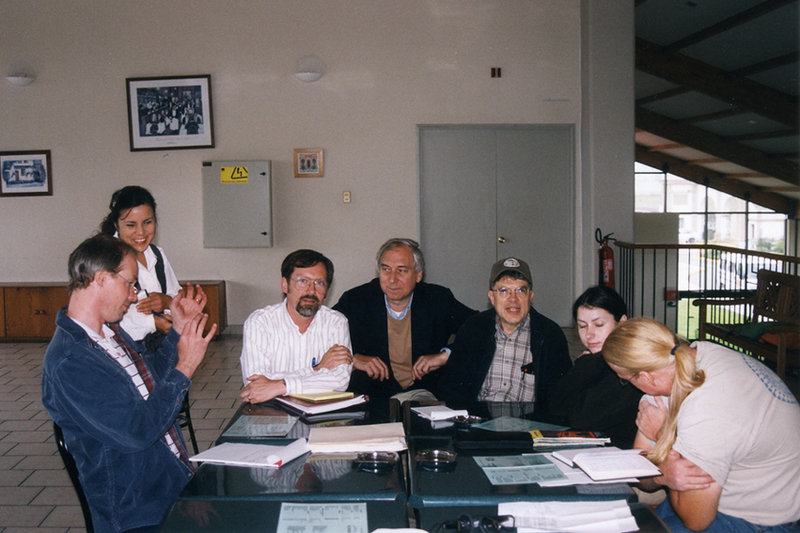 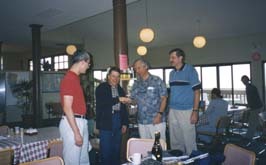 David Tholen, Jim Elliot, Jay Pasachoff, and Bryce Babcock, as the William team hands over a CD-ROM containing a copy of its data to Jim Elliot. 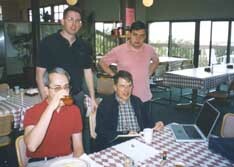 In the Hale Pohaku dining room: Mike Person, Jim Elliot, Jay Pasachoff, and David Tholen. 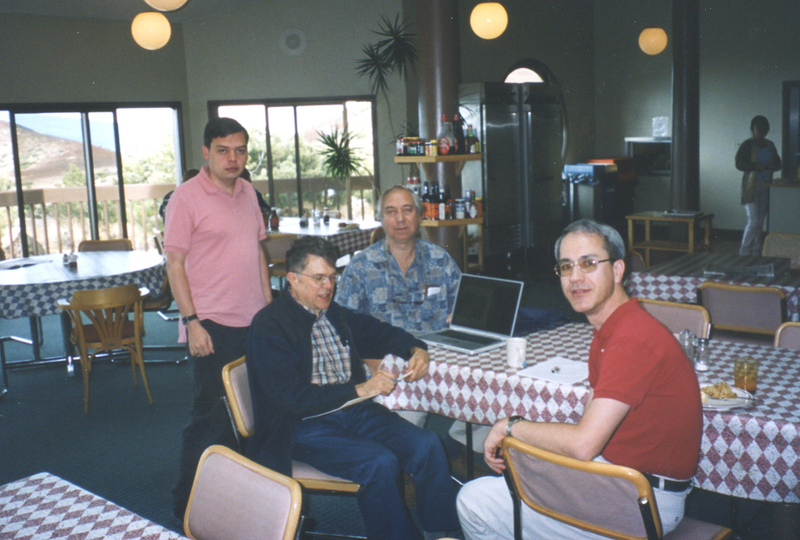 In the Hale Pohaku dining room: David Tholen, David Osip, Jim Elliot, and Mike Person. 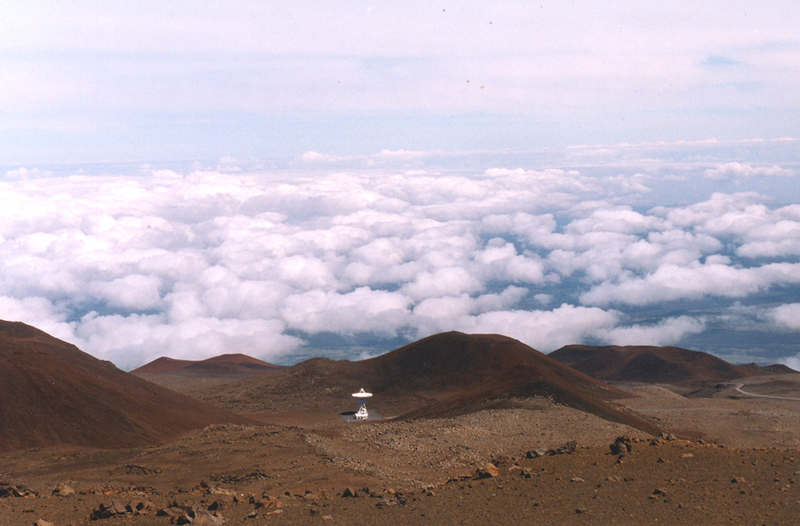 On the way down from the top, one can see a lone antenna from the Very Long Baseline Array, a project of the U.S. National Radio Astronomy Observatory. 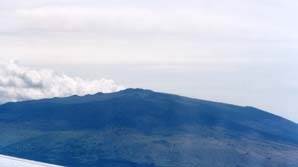 From the plane leaving the Big Island, the domes were barely visible on top of Mauna Kea. The Williams team visiting Gemini North. 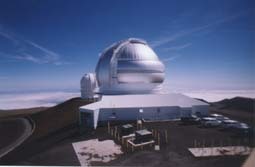 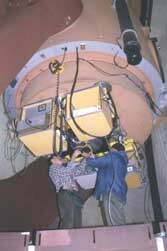 The Williams team was at the 2.2-m (88") telescope of the University of Hawaii. Here Bryce Babcock (Williams College) and a technician install the Williams College CCD system, which is capable of 0.5-s readouts.